A Life Force. Buy at Amazon. 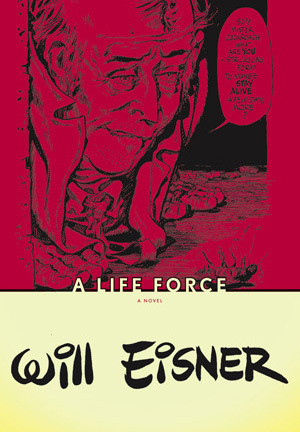 A Life Force (first published in 1988) is an examination of the lives, aspirations, beliefs and fears of people enduring the Depression of the 1930s and the rise of Hitler’s Germany as it casts its long shadow over the microcosm of a Bronx tenement on Eisner's Dropsie Avenue. Eisner wrote: "A Contract with God and A Life Force remain my favorites because in them I demonstrated what I believe a graphic novel could be." First serialized from 1983-1985 in Will Eisner Quarterly, the book was collected by Kitchen Sink Press in 1988, and afterwards was reissued as part of The Will Eisner Library imprint by DC Comics. 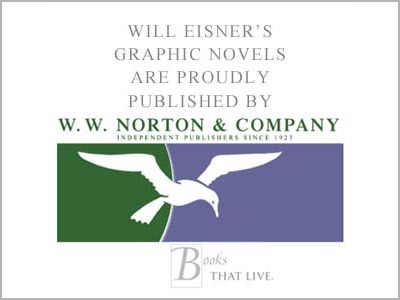 The book forms part of the 2006 hardcover collection The Contract with God Trilogy: Life on Dropsie Avenue published by W.W. Norton, together with A Contract With God and Dropsie Avenue. "Genuinely touching and honest... an uplifting book! It inspired me to keep going in this field!"